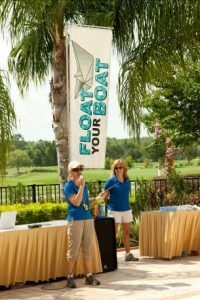 Float Your Boat – If you are looking for an event that won’t cause waves, one that everyone will enjoy, this tried and true favorite really holds water! 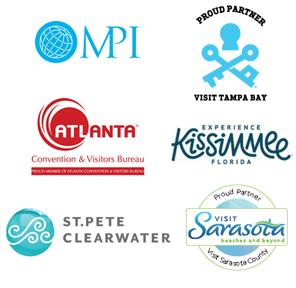 Guests arrive waterside to find a cruise ship atmosphere. Island music plays, tropical-colored flags float in the breeze and guests receive brightly-colored bandannas to wear as team identification. 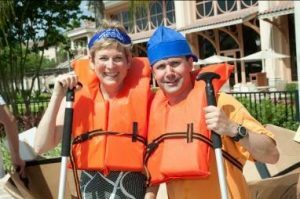 Delight shines on their faces, but this quickly dissolves into a look of surprise as they learn they aren’t boarding a boat – they are building one! Then, surprise turns to shock when they discover their boat-building materials consist of nothing more than cardboard and duct tape. Rulebooks and our roaming crew give them ideas on what can and cannot be done. Then, their creativity kicks in as they literally think outside the box to build a diverse array of vessels. 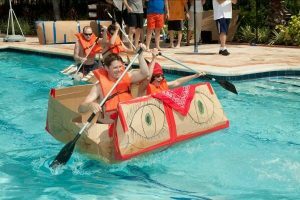 How will the cardboard catamaran fare? 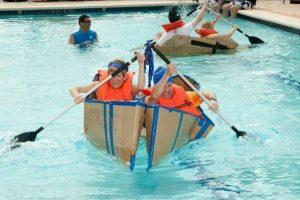 Is the corrugated canoe “tipped” to be the winner? Before setting sail to find out, teams launch their boat, not with a bottle of champagne, but with a sea chantey written to extol the virtues of their vessel. Then, it’s time to hit the water! Each two-man crew receives paddles and life jackets. Not that we don’t trust their designs – on average 80% of boats finish intact! Hopefully, teams built their boats to be hardy, for the winner of each heat must race again in a final regatta to determine the overall winner.